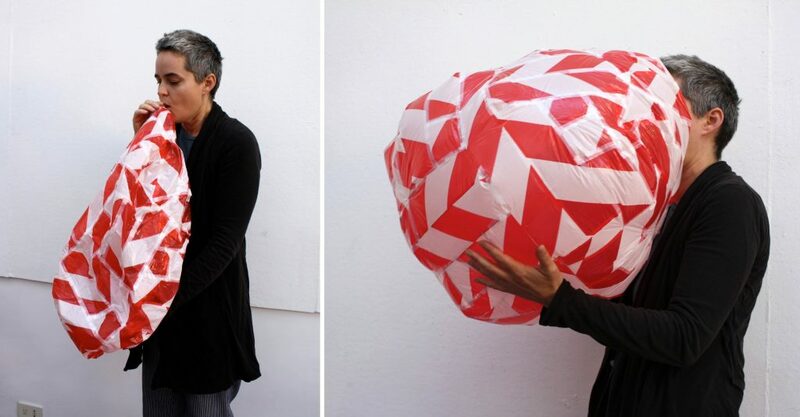 For your first assignment, you will work with a partner to create five inflatables inspired by Anna Hepler’s breath inflated forms as we saw in the video today in class. (The Makeshift video on this page: http://www.annahepler.com/video). You are supplied with colorful plastic and tape for this project. You are also welcome to use your own plastic and tape. You are also supplied with straws in order to blow up the completed forms. For the first one you make, allow yourself to simply experiment with the materials without knowing what it will become. Cut random shapes out of the plastic and then tape them together in a new order to see what happens. Cut the plastic into strips and curves, and then reassemble them in a new order to find a new shape. What forms are created when you put a round shape and a straight shape together? What character or characteristics does the form begin to take on? Is there a verb for what the shape is doing? As you are making these intuitive shapes look for what amuses you or seems quirky, weird or unexpected. Aim to surprise us next week in class with your shapes and discoveries. Come prepared to share your inflatables with the class for critique. Upload documentation to the class website by one week after the due date.